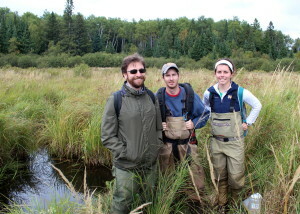 Notre Dame biologists study how native fish could be restored to the Namekagon River watershed. The skies above Cable, Wisconsin were unsettled last Friday, with rain showers interrupted by sunshine. Good fishing weather. But Patrick Shirey and his companions weren’t using typical methods. Shirey, a researcher from Notre Dame University, was accompanied by two Ph.D. candidates and a writer who was kind of wishing he had brought a fly rod. 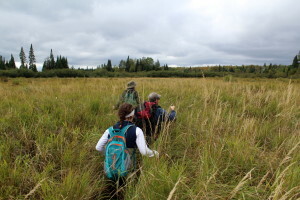 The group ventured into the remote upper reaches of a small creek in the eastern extremity of the St. Croix River watershed. They were looking for brook trout – the beautiful, fragile and native fish which once thrived throughout the Namekagon and its tributaries. Brookies have been largely driven out of the Namekagon River in the past century. Sediment from logging and other human activities has covered springs seeping into the river which used to keep the water colder. Non-native brown trout, which were introduced into the river about a century ago, thrive in warmer waters, and will even eat young brook trout. So the team had come to this sprawling swamp, where a small creek flows through flooded meadows between beaver ponds. Their mission was to take water samples which would be analyzed to determine if any brook trout swim there. After walking through trackless woods, the group clambered along a beaver dam to about its midpoint, where researcher Nathan Evans went out into the pond and took a two-liter sample of water. The water will be analyzed for the presence of brook trout DNA (a similar method has indicated the presence of Asian carp in the lower St. Croix). Stumbling through the tall grasses and knee-high water in the wetland below the dam, following the narrow, deep channel of the creek, Evans took samples at several more sites. Then, in a wide spot in the creek, little fish were spotted swimming. The researchers stared hard at them, determining at least one was not a trout but a chub, and the fisherman once again wished he had his gear. Visual identification being inconclusive, another two liter bottle was filled. habitat – of the upper Namekagon River watershed. 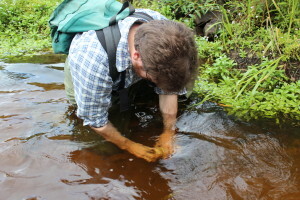 Besides collecting water and GPS coordinates from creeks throughout the upper Namekagon River watershed last week, the researchers were also busy on the work that Shirey has focused on recently: collecting and replacing thermometers which are left in the streams for months at a time, recording the water temperature the whole time. Shirey now has two years of temperature data for several sites in the Namekagon – especially above and below where spring-fed tributaries enter the river. Which is why his group is also looking at little creeks like the one they were sampling last week. They might be the last refuge for the brookies. After stumbling out of the swamp and back through the woods to their van, Shirey’s team made one more stop, to replace temperature loggers on Cap Creek, where significant habitat restoration work happened about 10 years ago. Silt and sediment was removed, the channel was restored to its original, and cold spring water once again bubbled right out of the sandy bottom and into the creek. Last year, Shirey’s team worked with the Wisconsin Department of Natural Resources to see what the trout population in the creek was like. In three passes with an electroshocker (which temporarily stuns fish), 882 fish were found in less than a 100 meters of stream. About half were brook trout, and only a handful were brown trout. Just below a crystal-clear pool where the bottom bubbled, Shirey knelt in the stream to replace the temperature logger. It took him a minute or two and when he stood up he shook his hands and remarked how cold the water was. Shirey’s research is supported by the National Park Service through a George Melendez Wright Climate Change Fellowship. As the world warms, his work is intended to identify ways for native species like brook trout to survive. In 2016, the National Park Service will start a three-year restoration project on a section of the main stem of the upper Namekagon, much like the work that was done 10 years ago on Cap Creek. The Park Service will remove silt from spring seeps, improving and increasing habitat for spawning and young brook trout, and then see how the fish population responds. 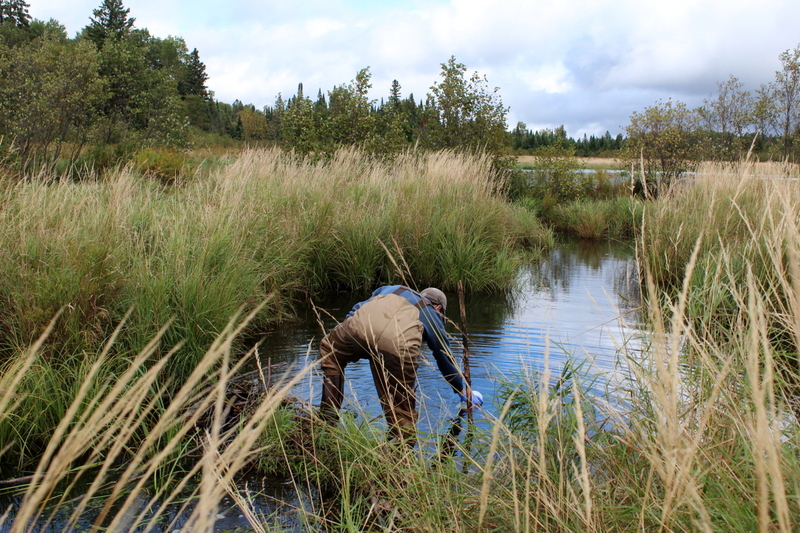 By the end of this year, laboratory analysis on the water samples Nathan Evans collected from that remote beaver pond should determine whether or not any brook trout swim in its waters. And perhaps next spring, the writer will return to the pond, and bring his fishing gear. This story and all photography are republished courtesy of St. Croix 360. Conservation news on St. Croix 360 is supported by the St. Croix River Association, which works to protect, restore and celebrate the St. Croix River and its watershed.